Qupé is dedicated to producing handcrafted Rhône varietals and Chardonnay from California’s Central Coast. Robert Neil Lindquist, a.k.a “Bob”, and his team employ traditional winemaking techniques to make wines, which are “varietally” correct, true to their type and speak of their vineyard sources and Terroir of origin. Qupé goal is to make wines with impeccable balance that can be enjoyed in their youth, yet because of the good acidity from cool vineyard sites can also benefit from ageing. Bob and his team are committed to sourcing grapes from some of the best and most prestigious vineyards in Santa Barbara and San Luis Obispo counties. Yet, before I describe the 2009 Qupe Marsanne Santa Ynez Valley California, it will be difficult not to talk about the legendary winemaker behind the label and his very interesting journey in the wine world, which inspired him at an early age and eventually led the way, bouncing from one opportunity to another, to become one of the best winemakers and producers of California central coast. Robert Neil “Bob” Lindquist was born in the Midwest and moved to Southern California with his family in 1964 when Bob was 11 years old. The sixties music scene quickly became a passion of Bob’s as bands like the Beatles, Beach Boys, Kinks, Byrds and Rolling Stones were electrifying the airwaves…rock and roll music still resonates with Bob and in fact the “Kinks” later became a plot device in Bob’s choice to pursue a career in winemaking. In the early ‘70’s while Bob was in college at UC Irvine he got his first taste of good wine and he was instantly hooked. Bob started hanging out at Hi-Time Cellars, a great wine shop in Bob’s hometown of Costa Mesa, asking a lot of questions and buying whatever wines he could afford…and in 1975, at the age of 22 years old, Bob moved from “SoCal” with his young family to the North Central Coast to pursue a career in the wine business. Bob’s first job was working the 1975 harvest at the Fortino Winery in the Hecker Pass area near Gilroy. When harvest ended he landed a job at the San Martin Winery tasting room in Gilroy where his enthusiasm and growing wine knowledge quickly got him promoted to assistant manager. San Martin was a dynamic and important player in the growing Central Coast wine business. When an opportunity to manage a new tasting room in Ventura County came along in 1976, Bob jumped on it. This lead to Bob’s discovery of the potential for wine in neighboring Santa Barbara County, and from his first visits to Firestone Vineyards, Santa Ynez Valley Winery, Rancho Sisquoc and Sanford & Benedict this is where he was destined to be. On January 1st, 1979, Bob moved to Santa Ynez to manage a retail wine shop in the little town of Los Olivos. This shop was way ahead of its time, and was owned by the son of the owner of Zaca Mesa Winery. Fate intervened (the Kinks) and in September 1979 Bob went to work at Zaca Mesa as their first tour guide just in time for the upcoming harvest. Zaca Mesa didn’t get many tourists in those early days so most of Bob’s time was spent working in the cellar learning to make wine under the tutelage of assistant winemaker Jim Clendenen, who would become Bob’s winemaking mentor. Zaca Mesa was fertile ground for learning about winemaking in this up and coming region. In 1982, while still working at Zaca Mesa, Bob started Qupé by buying barrels and grapes and traded his time to use Zaca Mesa’s facility. In that first vintage he made 900 cases of chardonnay, syrah and a dry rosé of pinot noir. After the 1983 harvest Bob left Zaca Mesa and went off on his own, continuing to rent space in other wineries to make the Qupé wines. As the winery’s production grew, Bob decided to focus on Syrah and other varietals of the Rhone, while continuing to make chardonnay, which always helped pay the bills. In 1989 Bob joined with his old friend Jim Clendenen (who had started his own winery, Au Bon Climat, in 1982) to build a winery facility of their own under a lease agreement with the Bien Nacido Vineyard. The wines continue to be produced in this same facility to this day. Bob is also a partner in Verdad, a winery dedicated to Spanish varieties produced by his wife, Louisa. In 2002 Bob and Louisa purchased an 80 acre ranch in the Edna Valley near San Luis Obispo, and the following year they moved to SLO with their then 2 year old son Theo. In 2005 they planted 40 acres at what is now called the Sawyer Lindquist Vineyard, where they are starting the next chapter of their life. In short, Bob Lindquist had an amazing “parcours” and is now a recognized and consulted winemaker, who transmitted his passion for wine and winemaking to most members of his family. Bob’s two oldest sons, Ethan and Luke Lindquist, are also winemakers and spent plenty of time around the ABC/Qupé winery. Daughter Paige runs the Qupé tasting room and wine club. 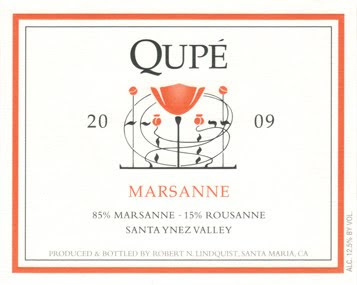 2009 Qupe Marsanne Santa Ynez Valley is a blend of 85% Marsanne and 15% Roussanne, including 70% Marsanne from Ibarra-Young, 15% Marsanne from Purisima Mountain and 15% Roussanne from Bien Nacido Vineyards. The Marsanne lots were barrel fermented and aged in neutral barrels, while the Roussanne was fermented and aged in one year old Francois Freres French oak barrels. The Marsanne lots were picked at the low end of ripeness, 21.2° for the Ibarra-Young and 22.2° for the Purisima, while they still have great acidity and fresh, balanced alcohol levels. The Roussanne holds its acidity better and was picked at riper sugars, 24.4°, which adds richness and complexity to the blend. 848 cases of 750ml and 98 cases of half bottles were bottled in June 2010. The resulting 2009 Qupé Marsanne Santa Ynez Valley is a classic example of Marsanne from cooler climate in central coast. Yet it is far from the Marsanne wines of the Rhone Valley, which are fatter and denser. This Marsanne has more refreshing acidity, crispiness and balance, and seems less viscous than its Rhone counterpart. Even the color seems paler. The nose exhibits aromas of white core fruit like white peach, but also citrus and fresh almond, with flinty mineral notes. The palate is rich and complex, and lively and racy, with a lengthy zesty finish, rather than being flat and dull like it happens too often with white Rhone when not properly handle and care after, more especially if inexpensive. Like Viognier, Marsanne and Roussanne are difficult grape varieties to work with and the result may sometime be unsatisfying, if not crafted with enough acidity and balance of all components. I must say that Bob isn’t like at his first vintage, and his experience is greatly reflected in his wines, especially this one (and his Syrah, which is for me always a standard of quality). Although ready to drink now, this Marsanne blend offers texture, structure, balance and great acidity, which should allow it to age nicely for the next 2-3 years, and more (but you know me, I hate speculating about how long a wine will last in the bottle, because there are too many factors that come to play in the life of a wine to really be certain and advance big numbers: how it was stored, oscillating temperatures, etc…). However, in my opinion, better drink it now than latter to enjoy the full characteristic of the flavors, which encompasses vibrant nuances of peach pit, citrus and green hazelnuts and honey in the lingering finish. Serve it as an aperitif with hors d’oeuvres, but also with fish and white meat dishes. Love your random post. Following you on Twitter.lovely the second paragraph starting for the first one down!